EKS InTec at the Automatica 2018. Visit us at Automatica 2018 from June 19 - 22, Messe München. We look forward to welcoming you at our stand together with FANUC. Here you can learn more about the latest achievements in the field of automation such as our Digital Shadow or the newest members of our product family, the . 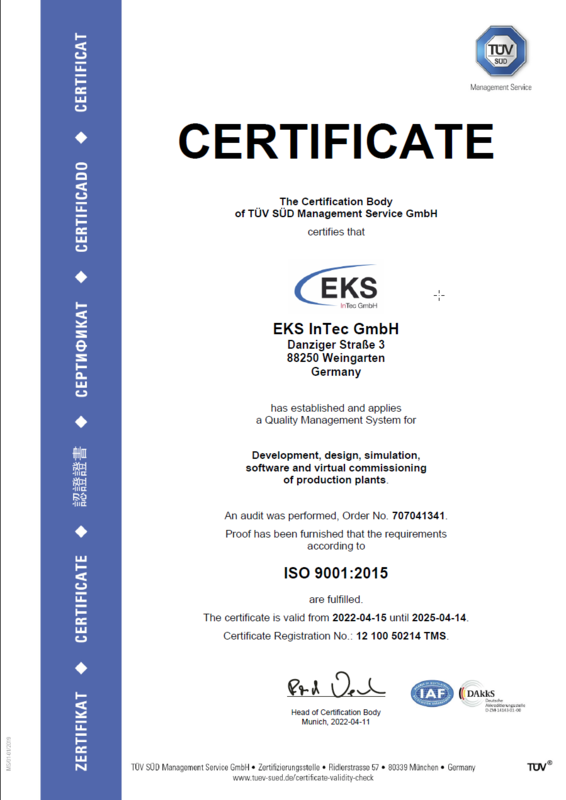 EKS InTec GmbH masters the complete digital development process of automated production plants, from planning to virtual commissioning. In our company, devices, stations, production cells and complete production systems are planned, designed, technically supported and extensively documented. Our tailor-made software solutions find their place not only in the mobility industry. You have a wish? One focus is the development and application of software for the "virtual plant". EKS InTec GmbH uses to implement virtual commissioning of production lines in real time. Constant innovations are not falling from the sky, which is why we are at the forefront of research in Europe. Today we are driving Industry 4.0, shape tomorrow with us. Rely now on a learning management platform with us.